Yesterday was my cousin’s 9th birthday! 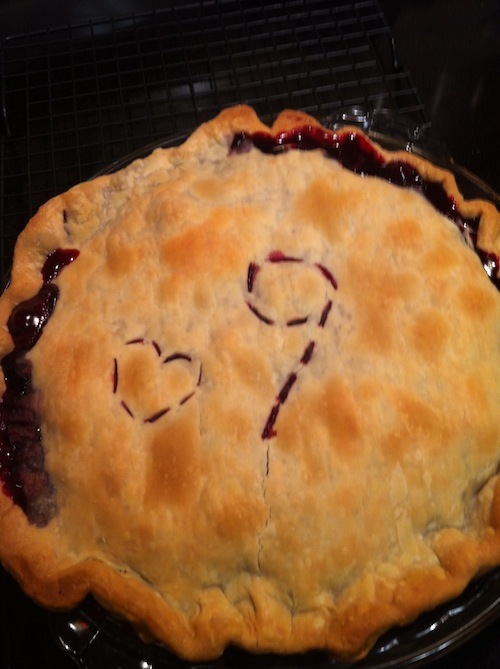 She had a wonderful party and to help in the celebration, I made Razzleberry Pie (Naomi doesn’t like cake, so pie it is! ), and Vanilla Cupcakes with Vanilla Bean Buttercream (recipe coming soon). I’m so glad Naomi wanted birthday pie, because it was a great excuse to make this delicious pie! Razzleberry is just a mixture of raspberries and blackberries, that meld into a delicious, slightly tart filling between two buttery pie crusts and are just divine served with vanilla ice cream. It’s definitely the perfect way to start off one’s 9th year. You’re already making good choices, Naomi! Keep it up! This pie tastes like summer, but is easily made with frozen berries, so you can enjoy the taste of summer all year. Preheat oven to 400°F. Spread one of your pie crusts over a 91/2″ pie dish. In a large bowl, mix together thawed and drained berries, with sugar, flour and orange juice (if using). Pour berries into prepared pie dish. Cover with remaining pie crust and crimp the edges between your thumb and index finger to seal the pie. Using a sharp knife, cut small slits into the top pie crust. Cover the edges with foil (or a handy pie crust shield), and place in the oven. If pie seems particularly full, you might place a cookie sheet or some foil under the pie to catch any drips. Bake for 30-40 minutes, until golden brown. Allow to cool completely before serving. Serve with vanilla ice cream.